With our Shaw Brothers Tribute only one week away we’re dedicating this week to posts about classic martial arts film screenings in London, from special guest events, to film festivals and even back to the 1970s for some vintage double-bill screenings. 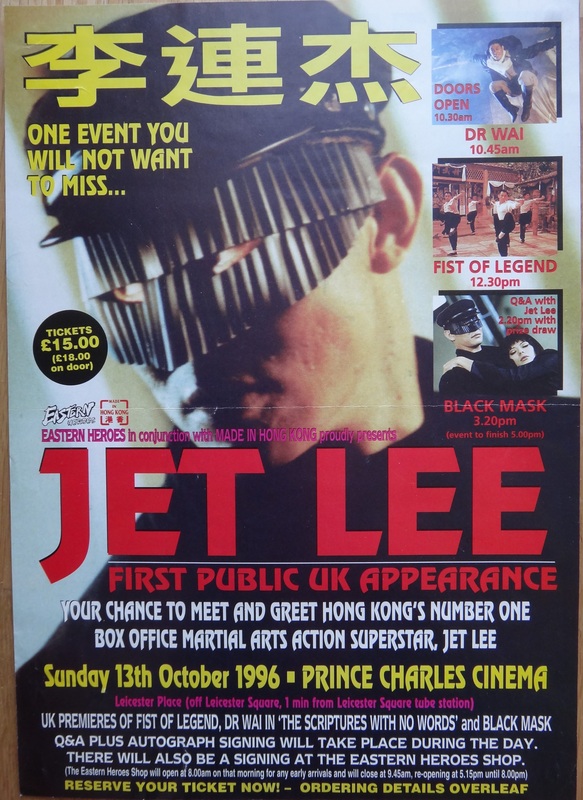 Today we’re taking a look at a very special event: The Day Jet Li Visited The Prince Charles Cinema – yes Sunday 13th October 1996 was the day Jet set foot on the stage at the Prince Charles and it’s a day that’s been stuck in my memory ever since, simply because I was lucky enough to be there. The day was put on by the kings of kung fu screenings at the time: Eastern Heroes. Having lost their spiritual home The Scala a few years before, they’d now moved location to the Prince Charles and it was there that the 3 film event kicked off at the early time of 10.30 with a screening of the then very new Jet actioner Dr Wai. My actual memories of the films aren’t that clear, what I more remember about the day was the incredible atmosphere, whistles were handed out to everyone in the queue, the house was packed and everyone was so up for a good time. 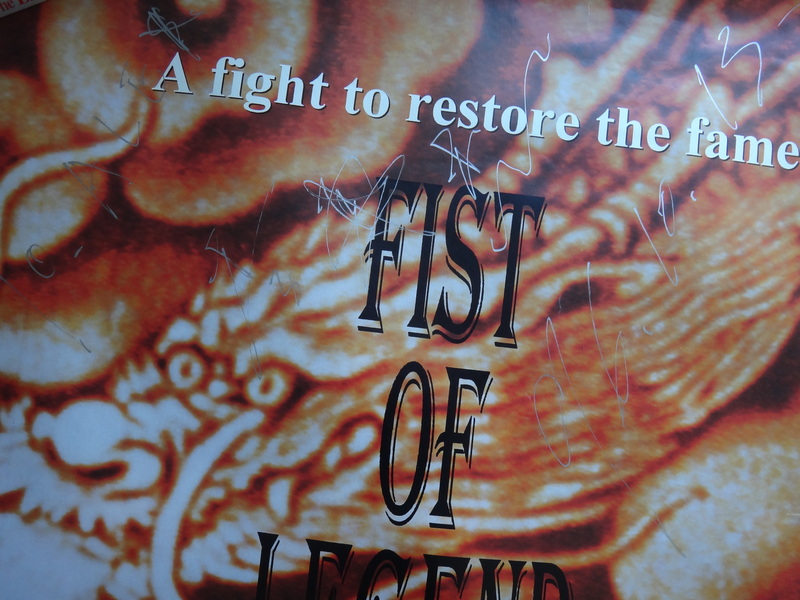 The films played great, especially the second film of the day, the absolute classic Fist Of Legend which caused everyone to the cinema to go into fits of wild screaming and whistle blowing. 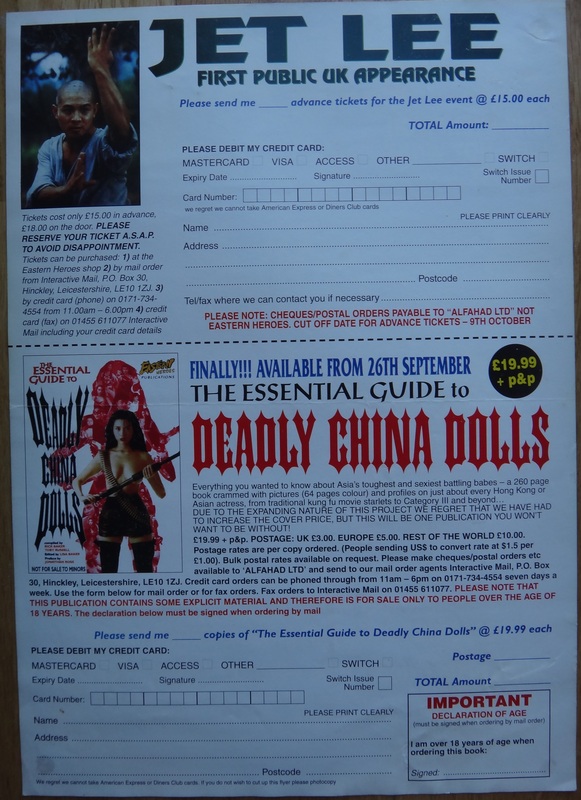 Now as to why this event was so special to me was what happened next, there was a prize draw to win one of three Jet Li film posters, which you could collect from the stage, meet Jet and he’d sign the poster for you. As you can imagine everyone in the cinema wanted to win, everyone that is except me, not that I didn’t think it was a great idea I just don’t really collect signed items, I was hoping someone who really wanted one would win. So when it came down to the third and final prize draw can you guess who won? Yes it was me! So I managed to fight my way to the stage, met Jet, he misunderstood how to spell my name and had to cross it out on the poster. 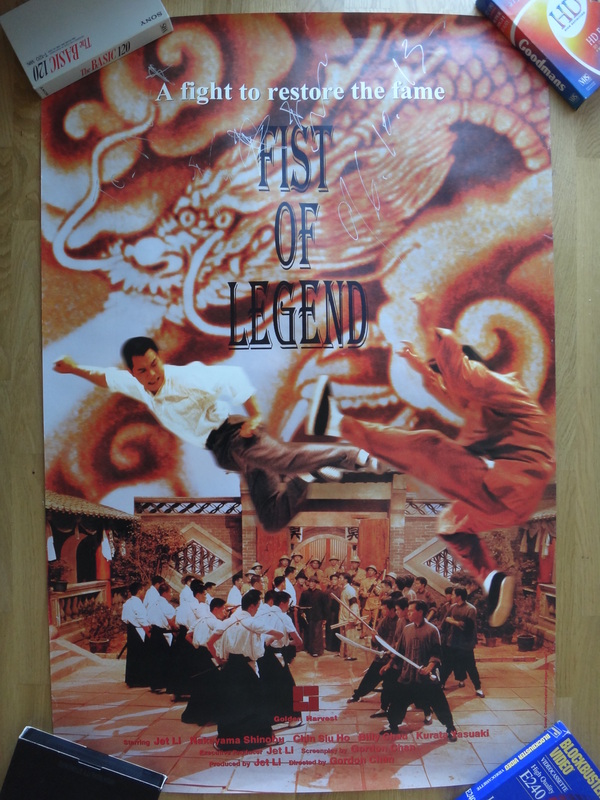 Now I had an original Golden Harvest theatrical one sheet for Fist Of Legend, signed by Jet, which even I suddenly realised was actually very cool. Everyone else seemed to think so as well, people started offering me money for it right away! After that Jet left the stage to much applause and then it was time for Black Mask. It was a fantastic day: it you look closely you can see my leg while I’m onstage in the video, I still have the poster, it’s a little bit battered but still in ok shape, though my ticket has long gone. Tomorrow on the blog we’ll be looking at the guys behind this event: Eastern Heroes, who practically owned martial arts screenings in London through the 1990s!